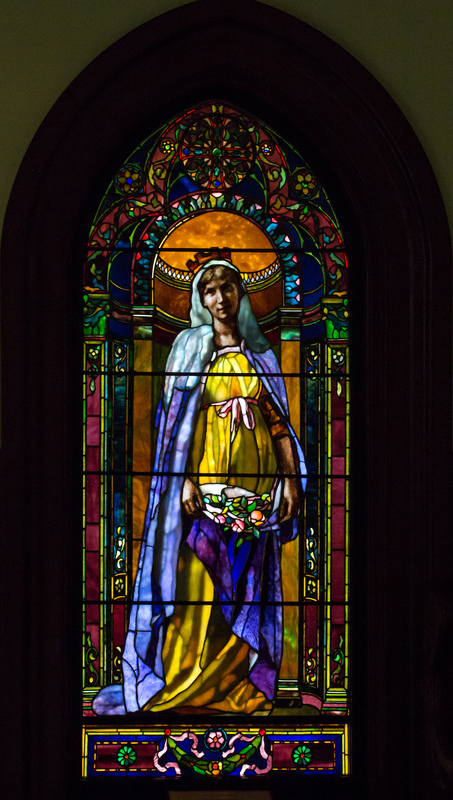 Three large figurative stained glass windows by John La Farge are now housed in a new chapel built on the campus of Salve Regina University in Newport, RI. Our Lady of Mercy Chapel was designed by Robert A.M. Stern, and constructed in 2010, largely to house these impressive windows. The chapel is an elegant modern shingle style edifice that blends well with the existing architecture of Salve Regina University. These windows were originally created for the Caldwell sisters’ private chapel in Newport in 1890-91. When their house was demolished in 1931, the windows went to the convent of St. Patrick's Church in Fall River, MA. This convent was demolished in 2004, at which time the windows were acquired by Salve Regina University, thanks to the efforts of William Vareika. The Caldwell sisters were both named Mary to honor their mother, Mary Eliza Breckenridge, and their family’s devout Catholicism. The mother died giving birth to a second child in 1867. The Madonna is therefore at the center of these three windows. The windows make up a kind of sacra conversazione, a meeting of saints in a spiritual dimension. The left lancet depicts St. Elizabeth of Hungary (1207-1231). St. Elizabeth was known for her works of charity. To thwart her disapproving husband, Elizabeth hid bread under her cloak so he would not see her giving it to the poor. One day he became suspicious and ordered her to open the cloak, but miraculously the bread was turned into roses. St. Elizabeth of Hungary was depicted by a number of artists in the late nineteenth century as an image of ideal charity. Eliza was a family name shared by one of the sisters and their mother, so the choice of Saint was quite appropriate. The center lancet depicts the Virgin Mary, in a window that copies the famous Sistine Madonna (1508, Dresden) by the High Renaissance artist Raphael. As much as he admired the Pre-Raphaelites, La Farge never shared their disdain for the sensuality and idealized naturalism of the Renaissance artist Raphael. Indeed, he was very sympathetic to the Italian artist’s reconciliation of earthly beauty and spiritual perfection, which he attributed to Raphael’s synthesis of paganism and Christianity. He marveled that he found prints of Raphael’s works “even in Cannibal Land” in the South Seas. La Farge sought to revive the art of stained glass while building on the traditional ideals of art to bring about an American Renaissance. The right lancet portrays St. John the Evangelist, who resembles the St. John in the Boston College collection window. St. John was the patron saint of John Lancaster Spalding (1840-1916), a priest who co-managed the Caldwell estate and served as a spiritual advisor to the sisters. One of the sisters seems to have had an illicit relationship with this priest for several years, which later led to some scandal when the details came out. Besides these figurative windows, there are also ten decorative windows by La Farge in this chapel. James L. Yarnall, “John La Farge's Windows for the Caldwell Sisters of Newport,” Rhode Island History, 64, no. 2 (Summer, 2006): 31-47. Yarnall, “John La Farge's Windows for the Caldwell Sisters of Newport,” 33.